53-years after Roger Patterson and Bob Gilmlin first claimed to have caught footage of Bigfoot on camera, the mysterious Sasquatch has once again been captured on film - or so one man believes. In the foothills of Northeast Provo on January 2, a local resident and a group of friends spotted a large and unfamiliar looking figure lurking a-top a rock on a hill-side. Noting its apparent towering stature, the man remarks 'Seriously, look how big it is,' before hastily concluding 'I think it's a Sasquatch'. 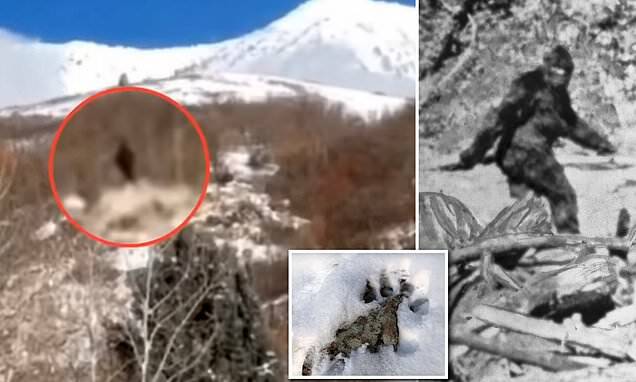 The camera then zooms closer the the alleged creature, showing the large dark figure moving slowly on the mountain. One of the witnesses, Austin Craig, was so convinced by the sighting he took the day off work to find more evidence of the legendary monster's presence in the area. 'You can't just see something that's maybe a once-in-a-century discovery and go do your nine-to-five job,' Craig said in an interview with WGN-9. Accompanied by a friend , Craig went back up the mountainside in search of Bigfoot but came back empty handed.